Rise Up Against Psoriasis Wins Golden Scalpel Award. Summit, NJ, August 21, 2017 --(PR.com)-- Arteric (http://arteric.com), a digital healthcare marketing agency that fuses exceptional software development skill with healthcare marketing expertise to help brands connect patients, caregivers, and healthcare professionals with the health information and tools that patients need to live longer, healthier lives proudly announces that the patient activation campaign Rise Up Against Psoriasis won a coveted Golden Scalpel award. 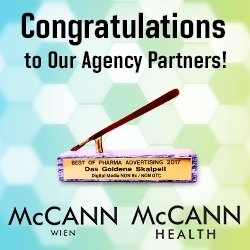 In collaboration with McCann Health London and McCann Wien, Arteric developed and implemented the campaign’s website centerpiece (riseagainstpsoriasis.com/de) for Celgene Österreich (Celgene Austria). The strategic process behind this award-winning collaboration is described in detail at arteric.com. Arteric’s president, Hans Kaspersetz, explains, “Rise Up Against Psoriasis has been successful because it authentically speaks to the psoriasis sufferer’s daily struggles with the disease - it calls out to all those directly and indirectly affected by psoriasis, sending the essential message that help is available. The website invites site visitors to complete the Dermatology Life Quality Index survey to assess the impact of psoriasis on their quality of life, helping to build context for a conversation with their doctor."